It is Monday, noon time. Only 8 hours left before start. We are sitting in front of our tent and are cooking pasta. It is time to fill up the body's storage capacities. After the big meal some small things remain to be fixed with the bikes, and once again we go over the equipment we plan to take along. We won't have a support vehicle, meaning that we have to carry everything we need: energy bars, vitamin and mineral tablets to add to the water, spare batteries for the lights, the necessary tools, warm clothing for the nights, and something in case of rain. Monday 20:15h: We are nervous. The first group of cyclists started at 20 h - this is the group in which the potential winners start, and the speed is high right from the start. Hundreds of spectators are cheering as we are starting in the second group fifteen minutes later. For safety reasons, the first 10 km out of town are led by a car. We take it easy and careful, since within this huge group of cyclists, accidents happen quickly. Monday 21:30h: Dusk sets in - the first night! We will experience four evenings, until we are back in Paris. It is a bit cloudy and temperatures are ideal to speed on. Due to many small hills, we only ride at a speed of 27km/h. It is a constant up and down, with lots of gear-shifting involved. We have a hard time finding a constant pace. Then we see a heavily injured participant at the road side being loaded into an ambulace - it reminds us to be careful, especially at night. 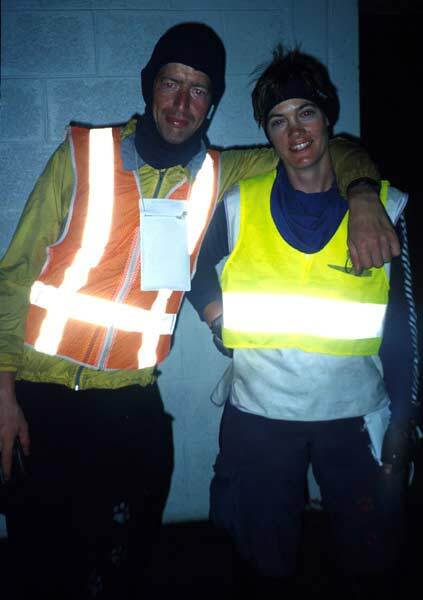 Tuesday 02:00h: The first checkpoint with food service at Mortagne au Perce, after 141 km. We check in at the control station and fill up the water bottles. There is quite a selection of hot and cold meals, ranging from pasta, rice and meshed potatoes to meat, fish, some vegetables, sandwiches, and desserts and fruit. But this whole selection is useless, if one is unable to eat. Although I am hungry, I have problems to swallow solid food, only liquid stuff is possible. This will not be sufficient to make up the 5000 kcal needed per day... I decides to live on reserves for the next hours and hope to be able to eat again at the next service point. 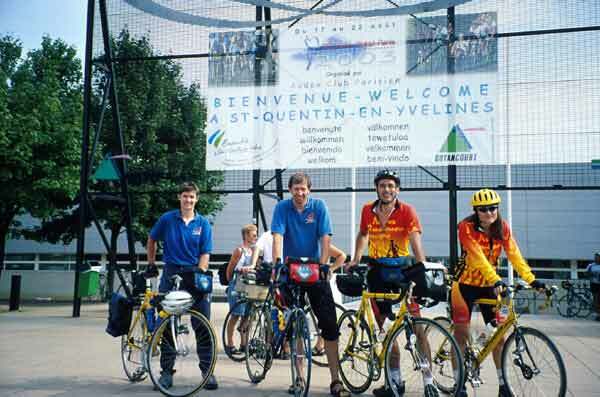 Tuesday 11:30h: We have reached the town Fougeres after 311 km, and we have covered a quarter of the distance by now. It is sunny and warm - we are making good progress. Rainy weather is actually one of the worst things that could happen to long distance riders, it will increase the energy necessary to continue, as the body will cool out very fast. 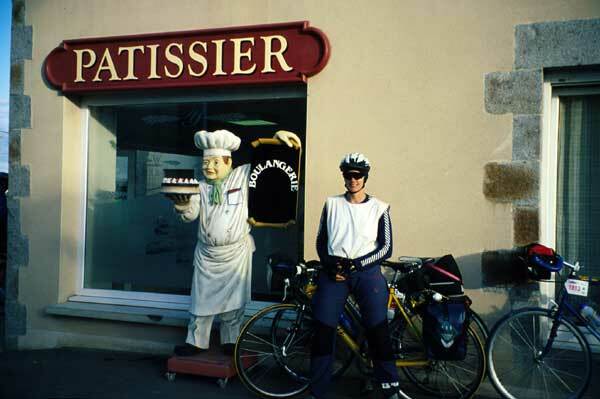 Although again a great selection of foods is offered, I still cannot eat solid food - I am continuing, riding behind Waltraud to save some of my energy. >Wednesday 03:00h: We feel worn-out and tired. After 529 km we reach the town Carhaix-Plouger. The night ride was less exhausting than expected, as the moon lit up the landscape and and we had a wonderful view of thousands of stars - an amazing sight possible only because we passed through few lit up villages. We had slept already one hour at the previous station in Loudeac to be ready for the night, but it didn't seem to be enough until 3 o'clock in the morning. Once again, we take a one hour rest, as we feel cold and tired. The sleeping room at the control station is a gym filled with mattrasses. Almost all of them are occupied by exhausted cyclists. Only two minutes later, we are also way asleep. Time keeps running while one is resting, therefore we have someone wake us up only one hour later. 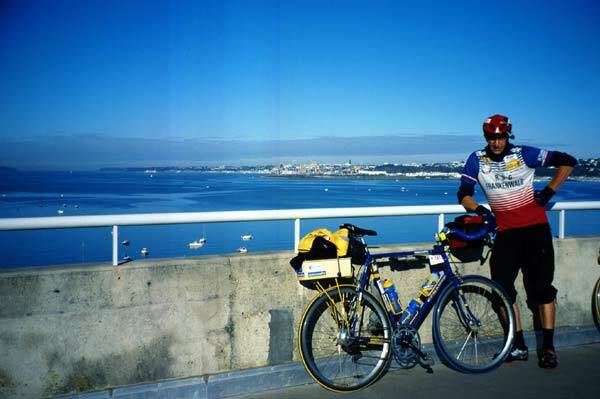 Wednesday 9:30h: We have reached Brest, and thus half the distance at 611 km! We enjoy fresh bread with ham or cheese for breakfast. Finally I am able to swallow solid food, it was about time. The second day on the road promises to become nice and sunny, on the down-side it means to take extra care of dehydration. Now it is going back - it is a huge motivation. And this motivation is much needed to fight the many hills on the way back to Paris. Wednesday 20:00h: After 773 km by now we are back in Loudeac. Another day is over. We plan to be riding as long as possible making use of the dim light of dusk. Therefore it is only a short break at Loudeac. Meanwhile I can easily eat two plates of pasta with vegetables and souce in less than two minutes. Seems like my energy resupply is working again. However, both of us are starting to feel pain from sitting, and also hands are starting to get numb. The rough road surface takes its demand. Smooth surfaces are rare, and at times it is really hard on body and bikes, feeling more like riding a gravel road. Waltraud is starting to have problem with the knees, however she can solve this problem with a regular dose of Aspirin. Thursday 01:00h: We reach Tinteniac - again we are extremely tired. After 859 km there is nothing left in us to keep us awake. Again we have an hour of sleep. As we are being waked up, we at first don't know where we are. A feeling of emptiness in the head. The feeling for daytime, even weekdays gets blurry with increasing time we are on the road, and with increasing lack of sleep. 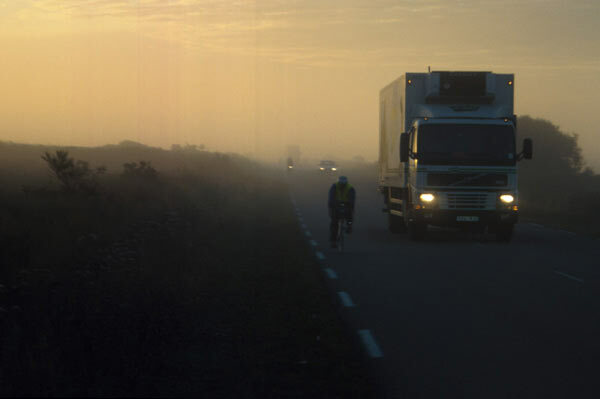 The fact, that it is only 370 km left to Paris, less than 24 hours, gives us the necessary drive to get going again. Thursday 07:00h: It is going to be another sunny day with blue skies. We are lucky to have such good and warm weather. We have just left Fougeres and are now passing through open landscape with large agricultural fields and meadows. In between there are small villages, some of which have neat castles. However, this year fields look brownish and dried out - the extremely hot summer was not ideal for the farmers. The high concentrations of ozone developing on hot summer days especially in rural areas now lead to irritations in the throat. Eating becomes painful. Thursday 12:00h: We have covered 1000 km, arriving at Villaines la Juhel. Only 230 km left. Now it is time for a good lunch meal, and then get it over with. Riding through the last few villages we have experienced an amazing support of the local population. Food and drinks was offered at the roadside, musik was played in the villages, and supportive signs were placed out on the road. 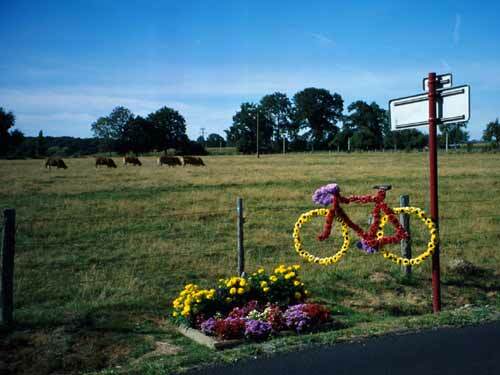 Yes, the French are very enthusiastic about road biking, especially during traditional events, such as Paris-Brest-Paris. During our third day on the road the support was very welcome, as on such a hot day our water supply did not last for more than 80 km. Thursday 22:00h: It's three full days that we are on the road by now. We have reached the last supply station at Noget le Roi. By now, we are fighting all kinds of pains: My toes seem to be wound, even cooling spray doesn't help it anymore. Sitting becomes more and more of a problem, and fingers are totally numb due to the rough road surface. Although it is only 60 km to the finish, we have a short break - there will be some hills waiting for us on the final stage. Friday 01:45h: We have reached the outskirts of Paris. At this time of day, nobody is there to welcome us, nobody is cheering at the roadside. However, the night time is now an advantage: The darkness of the night is replaced by a good illumination of the roads, and there is no traffic. We can thus speed ahead on the main roads, no need to find our way using the narrow bike paths. Even some traffic lights are turned off, so that we have a free way. We race ahead - it is amazing to still be able to put on such a pace after almost 1200 km. Maybe it is our deep desire to rest and sleep that drives us. We seem like crazy, racing along with a blunted mind. 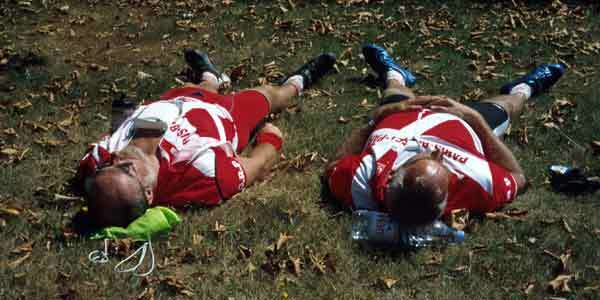 Friday 02:15h: After 78 hours and 1230 km we arrive at the finish in the suburb Saint Quentin en Yvelines. A last time we hand in our roadbook, and ride the final 3 km to the camp ground. Now there's only one thing: sleeping. 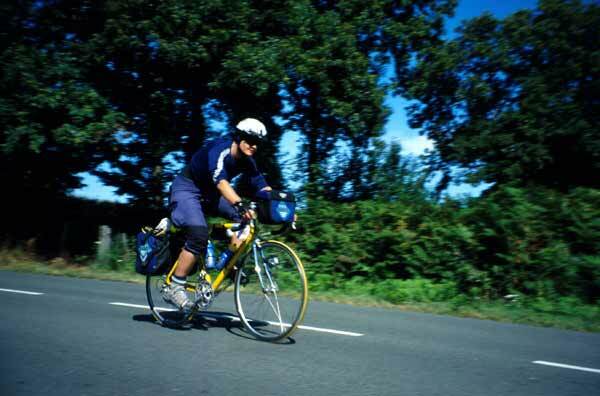 There are many long-distance road bike marathons you can take part in. However, those who want to test their mental and physical abilities are highliy recommended to participate in this traditional event Paris-Brest-Paris. The international atmosphere, the support of the locals, and just the fact of being part of something big seems an ideal platform to make possible something that seems to be unachievable. 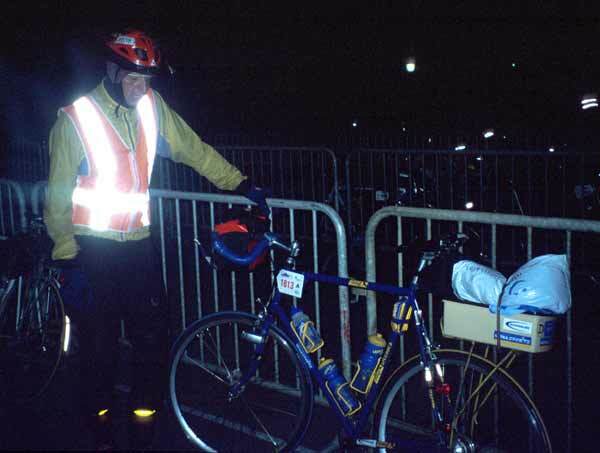 In 2003, it was the 15th time Paris-Brest-Paris was carried out sincce 1891, since 1971 it is carried out every four years. 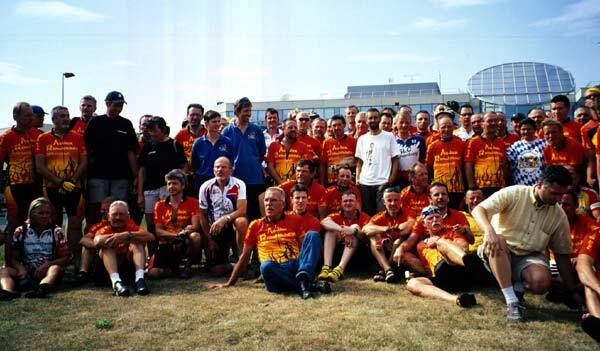 It is being organized of the Audax Club Paris, and the initial idea of the race was to demonstrate the suitability of bicycles for covering long distances. 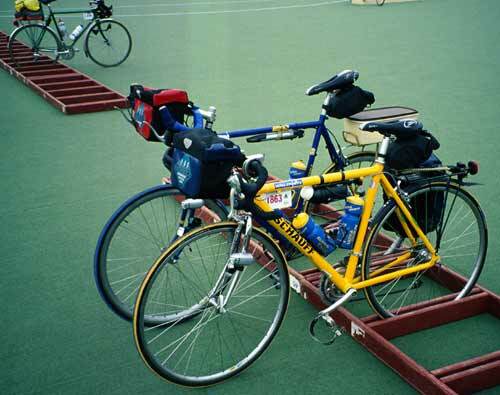 For the first races it was normal that riders carried all necessary items and only used support available locally (i.e. restaurants). 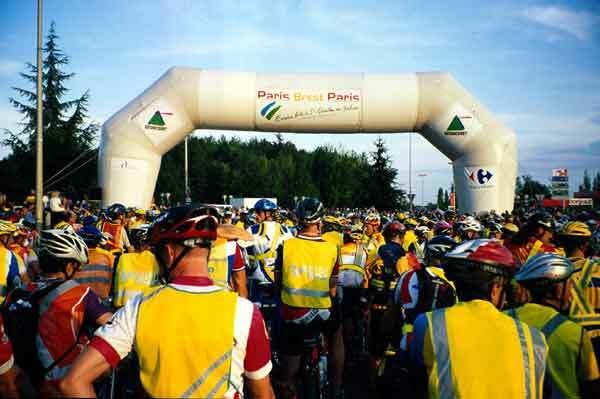 The 2003 year Paris-Brest-Paris had 4176 participants of which 3445 finished. 6.5% of the participants were women. About half of the participants were French, the other half came from all over the world, highest numbers of participants were from the US, UK, Italy, Germany and Denmark. We even met some riders from South Africa, Argentinia, Australia, Japan, Russia or Mexico. The winners covered the distance in about 42 hours and 40 minutes!